Tucked away in a serene corner of the world on a chain of 700 islands known as the Bahamas lies a retreat so alluring, it was once the private club for 1940's high society such as the Duke and Duchess of Windsor, and later a hideaway for celebrities-including The Beatles while they were filming Help!. Today, Sandals Royal Bahamian is the Bahamas' most elegant resort, offering two unique destinations in one. Enjoy all inclusive Bahamas vacations at this luxurious resort, featuring its own offshore island filled with every amenity, romantic adventures, and the region's finest seafood restaurant. A refined mainland is filled with European sophistication and extravagant details, from Roman colonnaded pools and exotic firepits, to ten other restaurants and a world-class spa. Voted Sandals Resorts “World's Leading All-Inclusive Company” 19 years in a row. Voted Sandals Resorts “Caribbean's Leading Hotel Brand” 20 years in a row. Voted Sandals Royal Bahamian “Bahamas' Leading Spa Resort” 3rd consecutive year, 5 years overall. Voted Sandals Royal Bahamian the “Caribbean's Leading Resort”. 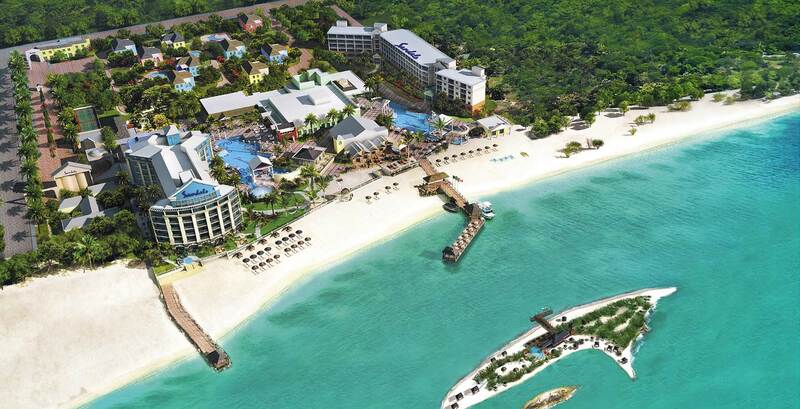 Voted Sandals Royal Bahamian the “World's Leading All-Inclusive Resort” 2 years in a row. 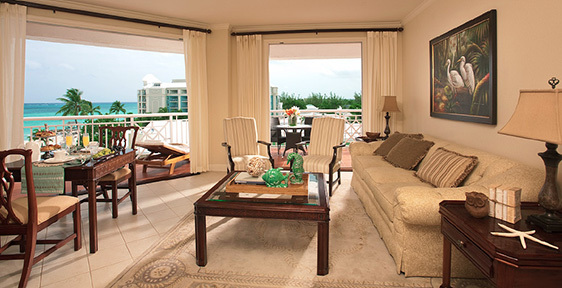 Located on the top floor of the Royal Windsor Tower, this Love Nest suite looks directly out to the mesmerizing, aquamarine Bahamian waters and Sandals Cay. Commanding in size and luxurious in decor, it offers a separate bedroom entered through double French doors, and a living room/dining room. Throughout, classic contemporary appointments and soft neutral tones create an ambiance of island elegance and includes a flat screen television in both rooms. The bathrooms feature a large vanity area and Roman tub. These suites also include Sandals' prestigious Butler Elite service, 24 hour room service, and VIP Rolls Royce or Mercedes airport transfers. Few resorts in the world can match the exceptional fine dining selections at 10 specialty restaurants. Or the hospitality at 8 bars serving unlimited premium brand drinks. Each restaurant boasts its own authentic ambience and decor, with masterfully prepared menus from internationally trained top chefs. Best of all, it's Sandals so no one's counting servings of anything including exclusive Mondavi® Wines. Bon appétit. All their pizzas are made fresh to order in the finest traditional Italian fashion. Sundowner “Swim Up” Bar: 10:30 a.m. to 7:00 p.m.
Sunset “Swim Up” Bar: 10:30 a.m. to 7:00 p.m.
Sunset Bar: 5:00 p.m. to 10:30 p.m.
Stewfish “Swim Up” Bar: 11:00 a.m. to 4:30 p.m.
Cricketer's Pub: 5:00 p.m. to 3:00 a.m.
Balmoral Bar and Piano Lounge: 5:00 p.m. to 12:30 a.m. Crystal Bar: 5:00 p.m. to 10:30 p.m.
Royal Bar (Beach Bar): 10:30 a.m. to 12:30 p.m. There are few places with better dive sites than the Caribbean. In fact, some of the world's most renowned reefs, walls and wrecks are found in these extraordinary waters. That's why divers flock to this corner of the planet, and it's why Sandals offers one of the most comprehensive scuba diving programs anywhere - and it's all included! Colombian Emeralds International, a leader in luxury travel retail for 35 years, offers an award-winning customer service experience, along with the finest jewelry and watches at Tax and Duty Free prices, across the most desired destinations in the world. The CEI ADVANTAGE is unmatched in the industry with benefits including: Global Customer Service, Free 30- Day Insurance and Certified Appraisals. Caribbean inspired spa treatments using regional natural products are available at the 29,000 sq. ft. exclusive Red Lane® Spa at Sandals Royal Bahamian. A tranquil sanctuary, the Spa offers 17 treatment rooms, a fitness center, beauty salon, a Yoga-Pilates studio, steam room, plunge pools and several intimate relaxation areas in secluded gardens.